Are the Priorities in IOOH vs. SEO? Over the past year, I’ve kept up with a few brands that I feel have done a good job of utilizing the OOH channel, particularly the “new” OOH channel – where offline is purposefully merged with the online and enabling technologies are at play. One of these brands is JC Penney. I’ve featured them twice here, and I’ve been impressed with the initiatives they’ve executed in this space. To me, the fact that they use mobile and interactive Out-of-Home (IOOH) shows they understand all of the channels at their disposal and more importantly, that they know this is becoming more and more a preferred and effective way to reach consumers. So, when then news about their SEO practices surfaced yesterday, I have to say I was surprised. My initial reaction – without asking any experts on SEO – was from the POV of a general digital marketer. How can a company make a decision to utilize emerging channels – mobile and IOOH – but not have a complete grasp on one of the basic (yet complex) fundamentals in their media mix? Or in simpler terms, how can they focus their efforts in building large, in-store touchscreen units rather than getting their SEO right? It makes me feel – again, upon first blush, and not having any insight into their operation – that someone there doesn’t have their priorities straight. How could this be? Don’t mess with Google, it isn’t worth it 98% of the time. We MUST be able to counsel our clients not to work with shady SEO companies, they will tell you they can provide results and then go out and buy links to do it. A brand could get burned like this very easily with very little knowledge of what was actually going on. I believe that this was the case for Penney, they can’t even get the URLs of their core pages right. Many SEO’s have often pointed out major hypocrisy of how Google hands out penalties. Major brands have been given passes because they are “vital” to results. BMW could do anything because if they weren’t in the SERP for “luxury car” Google users would think less of Google. So I think this says that Penney’s must have been pretty blatantly buying links on a large scale and that Google doesn’t view Penney’s as important to their results. Also maybe they found a brand to make an example of to get everybody on the straight and narrow without damaging their results. Penalty was confined to several non-branded keywords, if a lesser brand had been buying links on that scale they would have gotten blown out completely. They still rank fine for anything with JC Penney in the query. This is clearly a manually applied penalty and Matt Cutts said as much. I can’t remember another time Google pointed to a specific penalty and admitted it was manually applied. Mostly in the past they have stood on everything being algorithmic to the point that it insulted the intelligence of anything that could fog a mirror. Interesting they chose to point to manual on this one all of a sudden, might be a bit of branding change from we have the best results because of our algorithm to we have the best results because we work hard at it. 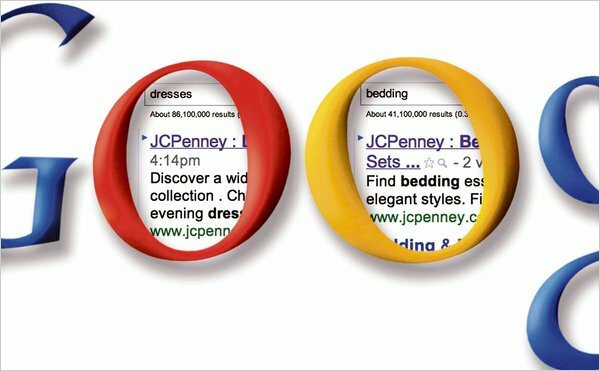 JC Penney spends between $12 and $40k a day on Adwords, according to Spyfu.com. Don’t ever let anyone tell you Adwords has a direct link to your organic rankings. Good stuff. I could probably expand on each one of the points above, but I don’t want to get into SEO-specifics here. My personal takeaway is this – it’s less about JC Penney knowing whether or not this was going on (but seriously, how can a company of this size not know what’s going on on this scale, especially with their monitoring and even warnings???). It’s more about the seeming oversight of not having an SEO expert in-house/on-staff in some form or fashion – someone who would have directed, caught, and presumably fixed the tactics. And more importantly, someone who is accountable. This is one of the hurdles this (D/I)OOH channel/industry faces – a consistent champion, from the agency and brand side, who will be accountable. Right now, I feel like the (D/I)OOH industry is fed by brands/agencies who are risk-takers. This is still an emerging/experimental channel, not a tried-and-true one like online paid/organic media. But the problem is, when there aren’t specialists who can take responsibility of those tried-and-true channels like SEO, when will there ever be specialist who can champion channels like (D/I)OOH? I know I’m being a little dramatic, but it does give me pause, especially when looking at a brand holistically, not just in the interest of one channel over the other. I think it’s our responsibility, as marketers/communicators, to understand how each of the channels work together – especially when emerging channels like (D/I)OOH & mobile are at play – and then provide counsel accordingly. As much as we can. We must do this. Our executions, particularly in the emerging channels, will be made stronger and more credible. And that’s what it’s going to take to become sticky, when reaching consumers while they’re out and about – strong stories from strong brands. Who consumers can trust. This entry was posted in Emerging Technology, Marketing, Mobile and tagged DOOH, enabling technology, Google, IOOH, JC Penney, Mobile, OOH, SEO on 02/15/2011 by Mike Cearley. Shoe shopping on Saturday at the mall with 3 kids – PAINFUL. I should clarify that – boot shopping for my wife on a Saturday afternoon and taking care of the 3 kids in a crowded section of a crowded store – HEADACHE PAINFUL. My wife found her boots, and in the end, that’s really all that matters. What I found, while trying to keep the clan busy in the shoe section, was JC Penney’s “Find More” touch screen kiosk. Even though it was pretty much hidden from major traffic, it wasn’t hidden from us. It provided a great source of entertainment, and I even had a chance to try to teach my daughter some of the finer points of usability and interface design. It was an awesome conversation. I haven’t used my scorecard in a while, so let’s dust it off and put this bad boy to the test. Purpose – Just as almost every one of these kiosks I’ve reviewed here, this is designed to sell products. The kiosk itself does not serve as a self-checkout unit, so if we want to get technical about it, it’s designed to help customers find anything that JC Penney offers and make the shopping experience more convenient. Appropriately named, “Find More,” I suspect anyone who walks up to this kiosk and sees what it is (title is big and bold at the top) and hears the opening V.O. to “choose from thousands of online only products,” will know that if JC Penney has it, they can find it here. Drama – It’s big and bold so from that standpoint, it’s quite dramatic. But it stands out like a big, ugly piece of technology in an inconvenient location in the store. This is clearly a fine piece of equipment – it looks like it would withstand a tornado, but it is not easy on the eyes. I also think the placement makes it seem like an afterthought more than a purposeful tool for customers. Not only is it away from any aisle, it’s tucked in the shoe department, which is crammed in the first place. The only reason I saw it is because I’m always looking for this sort of thing. Even if I wasn’t, the only reason I would have seen it is because I was sequestered in this particular section of the store. Since they only have one unit, I would really suggest putting it next to one of the escalators or store entrances. At the very least, move it up close to a busy aisle. It’s too good of a tool to be hidden. Insofar as the call-to-action goes, once you do see the kiosk, they’ve done a good job with big moving images and type and they support it with audio. From that standpoint, they did a great job. Usability – I would say the experience is a mix between an interactive magazine and a website. They have the real estate to utilize more images than words and they capitalize on it. But they structure it very much like a website, with the primary, secondary, and tertiary navigation in clear buckets. I like the way they duplicated the idea of breadcrumbs on the left-hand side of the interface. It makes navigating deep into this experience easy. All of the buttons/hot spots are large enough to press with any size finger and I love all of their instructional copy throughout (ie. – “Touch a Category to Continue.”) They’ve made this as close to browsing a website without duplicating the website experience as you can get, and I suspect that will help them with customer involvement. Interactivity – This is a single touch experience and the touch screen was responsive. All of their buttons/hotspots were large enough to get me where I wanted to go and I never had to press anything more than twice. They’ve even got the nice swipe capability that one expects from anything touch-related thanks to smartphones. They’ve also worked in a couple of extensions to this experience with the ability to email yourself and print out any of this information right from the kiosk. I would think these features are table stakes by now, but I’ve seen some experiences that don’t include them. So, as I would expect from JCP, they’ve clearly thought this through. Information – As you would expect, they’ve got any and all product information you can imagine. It’s all hooked to JC Penney’s system, so if this particular store doesn’t have the item you’re looking for, you can see which one does, where it is, and even a way to contact them. They use large images and audio to attract customers to the kiosk, and throughout the experience, they have nice videos that support particular products (a favorite feature of my daughters). I was impressed that the experience was ADA accessible. The one downfall was the absence of social extensions, even a way to get to JC Penney’s FB page and/or Twitter page. Customer reviews should become table stakes before too long. Personalization – Other than the email and print options, this experience is the same for everyone. They could really make this a special experience for a loyalty program. Everything I said about the opportunities Target has to personalize their kiosks apply here, too. This is a great example of an IOOH solution, particularly a retail-based kiosk. I think JC Penney is one of those retailers who get it. They understand multi-channel and how important it is to engage consumers throughout their shopping and brand journey. I wasn’t surprised to see this in the store. I’m looking forward to seeing how this experience evolves because although I think they’re doing a great job with what they have right now, I think there are many easy opportunities that they are missing. Have any of you seen this kiosk? Would love to hear your thoughts, too! This entry was posted in Out & About and tagged 11th Screen, IOOH, JC Penney, Kiosks, Out & About, touch screen on 11/13/2010 by Mike Cearley. The topic on my mind most recently is “merging the offline with the online” and I’ve been hyper-aware of noting examples when I see it. I think this is a practice that brands must work capitalize on when forming their cross-channel strategy. We operate in an ecoystem so connecting with consumers wherever they are (and driving them deeper into the brand) is key, particularly in today’s world. This is difficult to do, for sure – different departments are in charge of their own particular “house,” they each have different objectives, and in the case where they do work together to drive deeper experiences, there has to be a plan in place to keep people engaged. Remember, this is a relationship that brands are trying to build, and it requires an ongoing dialogue. So, JCPenny gets some props today. 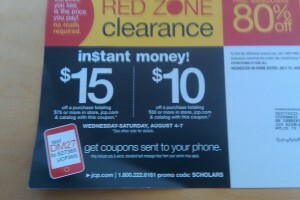 We pulled out a JCP flyer from the mailbox this weekend and prominent on both sides of the flyer was a call-to-action for mobile engagement. This is a simple way for JCP to use their existing collateral (they’re going to print and distribute these flyers anyway) to a) engage consumers in a different way b) keep an ongoing stream of communication, albeit only push messages and c) incentivize them to purchase. Now, putting this on a paper flyer is one thing. Communicating with the consumer is entirely different. Frequency of communication, the offers, and the actual words is where the real thinking and work comes in. Even with SMS coupon initiatives, brands still have an opportunity to speak their voice. That voice is instrumental in defining the brand and the relationship. They can’t push messages out too frequently, but they can’t disappear either. I think with an engagement like this, consumers are more tolerant to updates, but they will turn them off if they’re coming too frequently or not enough. As a brand, you really have to know your consumers’ behavior and attitudes to both mobile and shopping before you can really decide on the frequency. So here, I applaud JCP for capitalizing on the “low hanging fruit,” but it will be interesting to see how they capitalize on the meat of the program. This entry was posted in Uncategorized and tagged JC Penney, Mobile, offline to online, SMS on 08/09/2010 by Mike Cearley.